Home » What you can do » Inspiring enterprises » What’s a Transition-oriented enterprise? New businesses can choose embed the principles in their business model design from the outset, and existing businesses can consider whether they reflect the principles or not. Other types of commercial enterprises can also help meet the aims of REconomy and Transition. In fact, a wide range of business models in each local economy can help provide the diversity needed for stronger resilience, including privately owned for-profits and ‘regular’ social enterprise. However we wish to focus our efforts on the TEs at this time as they best support our aims and they are under-represented. Other local economic partners may wish to focus on supporting other types of businesses. A Transition Enterprise is a financially viable trading entity that fulfils a real community need, delivers social benefits and has beneficial, or at least neutral, environmental impacts. Note that ‘viable’ means it at least meets its costs; also that alternative means of exchange may be used. While we talk about businesses and enterprises here, much of this can also apply to individuals creating a new livelihood that might not be formally constituted as a trading entity. We suggest that TEs apply commercial strategies for improvements in social and environmental conditions, rather than maximising profits to external shareholders or just providing jobs – they do provide jobs of course, but also so much more. Clearly TEs can’t transform the local economy on their own – there need to be systemic changes as well, for example, systems for alternative means of exchange, pricing that values natural capital, more collaboration and co-operation between smaller local enterprises, industrial symbiosis where the waste of one businesses is used by another, and so on. We suggest these are aspirational, voluntary and self-assessed – not something we expect every single enterprise to fully embrace from the beginning. This is not intended to be used as a ‘kitemark’ scheme. 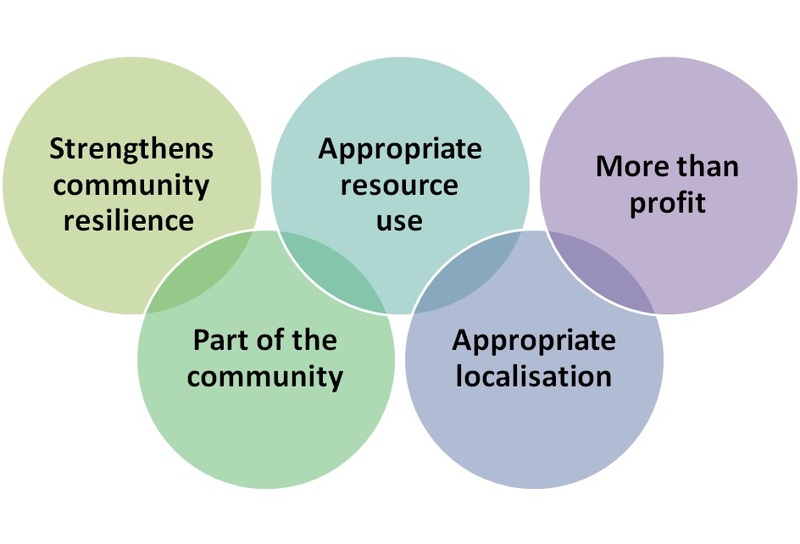 Strengthen community resilience – TEs help ensure the main needs of the community are met despite wider economic instability, energy and resource shortages and global warming impacts. TEs are also resilient in themselves, seeking to be financially sustainable and as independent of external funding as possible. For example, food enterprises like Norwich Farm Share and Stroudco provide low cost, healthy, seasonal food direct to local residents while helping them reconnect with each other, with food and nature. Appropriate resource use – TEs make efficient and appropriate use of natural resources, respecting finite limits and minimising and integrating waste streams. The use of fossil fuels is minimised, and use of renewable energy sources maximised. For example GroCycle pioneered the growing of Oyster mushrooms from local waste coffee grounds and significantly reduced the energy required compared to traditional cultivation. More than profit – TEs aim to provide affordable, sustainable products and services and decent livelihoods, rather than just generate excessive profits for others. TEs can be profitable, but excess profits are used for wider benefit rather than just enriching individuals. For example Repowering London is owned by the local community, where profits from selling renewable energy go back to these local investors and to projects to reduce local fuel poverty. Part of the community – TEs work towards building a common wealth, owned and controlled as much as is practical by their workers, customers, tenants and communities. They treat and pay all workers fairly. They have structures which are as open, equitable, democratic, inclusive and accountable as possible. They consciously operate as part of a collaborative, mutually supportive local system. For example Comrie Development Trust is owned and managed by local people who are redeveloping an old army camp for local commercial use. Of course, for profit enterprises can also choose to operate in these ways, even if not legally obliged! Appropriate localisation – TEs operate at a scale appropriate to the environment, the needs they are meeting and their business sector, with regard to sourcing, distribution and interaction with the wider economy. They don’t all have to grow endlessly. They provide local goods for local people as locally as possible, where this makes sense. For example the Big Lemon environmentally-friendly bus company in Brighton is a Community Interest Company. Enterprises like this need to work at city scale or wider – and some enterprises make sense only at regional or national level. See more examples of Transition-oriented Enterprises here. We suggest that this is as far as we need to go with this definition at this stage. Perhaps we can better see these as a set of principles that new enterprises themselves help shape? It’s not yet clear what sort of economy we will see emerging over the next few years, or what types of enterprises will evolve out of Transition. The evolution of local economies that have even a small percentage of enterprises meeting these characteristics will be a massive shift from our current globalised capitalist economic system. We will revise this definition as appropriate, apply it with caution and develop a means by which we can evaluate against it, as well as its usefulness overall. Note: this is version 3 of this definition, updated October 2014.